← A day in Minor OT and Circumcision Workshop! Well,although the picture quality is not that good, cause taken by phone camera, but obviously what we are looking here is GREEN URINE and this is not a joke! 1)One of the most common reason for green urine is the food you eat, those who ingested high chlorophyll content foods like asparagus and breath mints are most likely will developed green urine.And this is not dangerous, it is only part of our body metabolism. 2)Drugs,guaiacol contained in many cough medicines, magnesium salicylate Doan’s or Momentum(NSAID), and thymol, an substances in Listerine.Rinsapin is an antibiotic that can cause a green urine or blue urine color. Any other medication that uses a green or blue dye in the medicine can cause a green urine color. 3)Infections caused by pseudomonas.The pus and the pigment may contained pigments which caused for the green urine. Well, that what I can get, if you got any more info about the causes for the green urine, do feel free to drop a comment here! 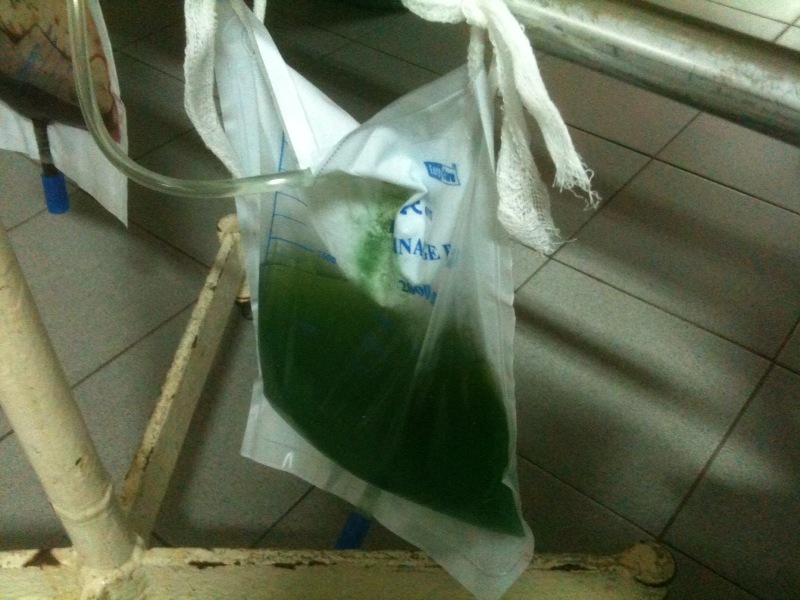 This entry was posted in Life, Little Medical Knowledge and tagged green urine. Bookmark the permalink.